Alex J. Cavanaugh: M Pax’s Favorite Astronomizing Moments, WALL-E and ET Pumpkins, Ninja News, Monster Trivia Answers, and Mini-Alex! M Pax’s Favorite Astronomizing Moments, WALL-E and ET Pumpkins, Ninja News, Monster Trivia Answers, and Mini-Alex! M. Pax is here today to discuss her best moments as a star guide! 1. Discovery. Every time I find an object, it’s as thrilling as the first time. I don’t use a computer. I use star charts and an electronics-free telescope. When I started, my astronomy friends taught me how to point at Jupiter. It and the Moon were my entire repertoire. Now I can find a hundred objects. 2. My favorite summer object: M24. It’s a densely packed star field – a star cloud – above Sagittarius. It fills my eyepiece with stars. It’s stunning. 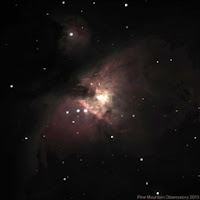 Overall, the Orion nebula is my favorite [winter object]. 3. Giving Robert his life’s dream. Robert visited a few summers ago. He told me it was his life’s dream to see a nebula. I gave showed him five then told him he needed a new life’s dream, because 9 was way too young to be done with that sort of thing. 4. Showing kids how to use my telescope and letting them. “Come see my star,” they like to say. Awesome. 5. Being able to give a person in a wheelchair a tour of the night sky. It was possible with my Dobsonian. Yeah, most of my triumphs have to do with giving someone a special night, one made of stars and dreams. It’s the most awesome job, and that joy is what I’m paid. I can’t wait until next summer. Doralynn Kennedy’s Spiders comes out today. Congratulations, Doralynn! Karen Lange’s Homeschool Co-ops 101 is now available! Buy it at Amazon or Barnes and Noble. Congratulations, Karen! Nigel Mitchell’s latest is now available – Six Guns of Madness. Purchase it at Amazon. Congratulations, Nigel! Julie Musil is the author of YA fiction. As the mother of three teen boys, she’s immersed in teen speak, drama, and gym socks. She loves to chat--just ask her Super Supportive Hubby, the guy with the glazed eyes. Connect with Julie on Facebook, Twitter, or her blog. I’m always envious of the prizes you guys win. 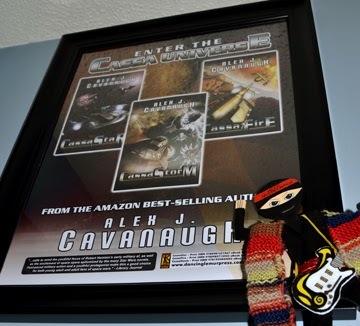 This time however, my publisher sent me one of them – the Cassa Universe poster! From EgoTV Online - visit the site for even more! Every viewed the stars from an observatory? Excited about the new books? Get any of the trivia right? And did you carve a pumpkin this year…? Be sure to visit Sandra Ulbrich Almazan! What an awesome post, Mary! Love the pumpkins. People are so crafty these days. Oh, and look. I'm first. I'm putting a telescope on my wish list. I think that sounds like an amazing way to spend a summer. I would *love* to have a telescope strong enough to see more of the night sky. Very much interested in Spiders. Didn't do too bad on the trivia, forgot they were called Graboids! A star guide sounds like an awesome job. I love looking at the night sky! I wish I knew exactly what I was looking at, but I appreciate it all the same! There's something special about watching the night sky. And I still say that's the best photo of you, Mary!! I LOVE it! Looking at the stars always fills me with the wonder of how small we really are in comparison. Bet you're going to give that poster a special piece of wall space! I just loved your poster , are they just at your publishers or can one purchase one? Congrats to Mary and Julie! Sounds like a great job, Mary! Thanks for stopping by my blog today, Alex. The poster is awesome. I must tell my publisher (me) to make one of those when the Catalyst Chronicles series is complete. I have viewed the stars from a small observatory. The most profound experience I ever had was when I saw my first galaxy - other than the Milky Way. The space inside the observatory was very small, cramped, there were three of us in there. When I took my eye away from the eye-piece I was so disoriented I didn't know where I was or how to move out the way to let my husband look. It was awesome/terrible in the most wonderful way. Whoa -- awesome poster! I agree with mini-Alex's happiness. And VERY cool pictures, M. -- here and at your own blog! Some might think that "star-gazing" means crowding up to the red carpet to catch a glimpse of Lady Gaga, but all the cool people know the REAL beauty is best seen with a telescope from a place with no light pollution (and those places are getting hard to find around where I live). Melissa, you are indeed first! Elizabeth, I used to have one. Fran, I think only two people remembered. Suzanne, it already has one! Yvonne, they printed them special as giveaways - I was just lucky enough to get one. Sandra, thank you! And you should have a poster made. I love using the telescope with my kids. I live on the outskirts of the city so the view is ok.
Nigels book sounds great Congrats! No pumpkin carving for me this year, just used acrylic paint instead. Having lived in Oregon for awhile, I remember those beautiful skies. I went there after NYC, where you almost never see stars. Mary Pax's pictures always leave me breathless. That poster is AMAZING! And it looks really good on your wall. I should make a dragon pumpkin. I love hearing about Mary's job. I find it very fascinating. A guy in the neighborhood used this big open dirt area to set up his telescope during the summer and stargaze at night. One time I asked him about it while running by (I like to jog at night). He was taking everything down and said to stop by next time he's there and he'll let me look through. Then... in the next week they built a house over that piece of dirt and I haven't seen him since. So... that's my sad stargazing story. Lucky, Mary! We've checked out the starry skies of the Grand Canyon, in Arizona, Bryce National Park, in Utah, and Julian San Diego. I 'd love to spend more time doing it. But there's too much light pollution in LA. The new book look good, but the spider one looks creepy. Yeah! 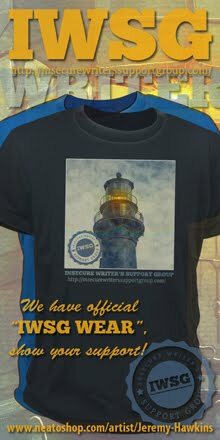 You got author swag. Very nice! Mary, that was awesome of you to do for the guy in the wheelchair! He'll remember and appreciate that for the rest of his life! I've been to the Griffith Observatory many years ago. Need to take the kids there sometime so they can experience it. Great to see M Pax here today. Being a guide sounds like a fun adventure. Interesting post by Mary. I have seen the "fake" sky at several observatories, and even in a language I didn't understand so I really had no clue what I was looking at. As for pumpkins, even it were the right season they are gray in New Zealand - and never carved. Wow, very cool CU poster! We carved some pumpkins this year...I posted them on my Google Plus page, but might do a quick blog post as well. They didn't turn out half bad. LOL! Robert certainly does need a new life's dream. The poster is cool. So are those pumpkins. Sounds like a great job, M. Pax! You're so lucky to love what you do! Alex! That poster is freakin' amazing! Good for you, you deserve something awesome. Ooooh, it was so fun to read about M. Pax's star gazing! Congratulations to all the authors with their amazing news. Alex, thanks so much for sharing my cover with everyone! I really appreciate it. I've never been to an actual observatory but I'd sure like to go. What a lovely way to spend summer, looking at the sky. Wish I could visit her. Wrong side of the country. Lots of new books and yet Andrew Leon is worried about people not reading any more. Surely not. Got one monster right as you know. Forgot to say I love the WallE pumpkins, my favourite characters. I love your poster, Alex. I bet that has a very special place in your home. What an awesome poster. Love it! And I always love to read about Mary's experiences at the Observatory. I'd love to visit it myself someday. Very cool to be able to point out the night sky to people in detail. And cool poster! Mini Alex looks so pleased with himself. And rightfully so. And I did pretty darn good on those movie monsters. I'm pleased with myself. Mary, I loved your post! What a fulfilling way to spend an evening. Wonderful guest post, Mary. I've never been to an observatory, but one day I hope to get a chance. Congrats to everyone who has books out this week! And that's an awesome poster, Alex. Off to Sandra's! The poster is gorgeous! And I have two favorite memories of the night sky (and what a cool thing to be a star guide!) The first was a friend with a telescope who showed me Saturn. I was completely blown away. The second was a "moon walk", where a bunch of guides set up telescopes in a field and invited folks to join them in gazing at the full moon. That is where I learned to see the lady in the moon instead of the man, and now I can't see the man at all, just the glamourous lady! OH! THAT POSTER! That is just downright gorgeous, that's what that is. Awesome, awesome, awesome!! A star guide? How cool is that? I miss those glorious night skies... can barely find a star in the sky here. To see the sky I remember as a child, I have to head up the pass and put the mountains between me and the city. Thank you for sharing my book cover and release!! And thank you for all the support you've given me. Madeline, what are the odds...? Al, you should make a dragon pumpkin! Brandon and Bryan - bummer! Rhonda, a gray pumpkin would be eerie. Carol, how did you cheat? We're carving pumpkins tonight. Still not sure what we're going to do. LOVE the poster! That was a really nice interview with M Pax! That poster look so cool, congrats! Congrats to all in the news-I will definitely check them out! I have started my holidaze shopping. I love these pumpkins. I was going to carve Stephen King out of mine-now I am scared. I've never kept up much with stars--not the ones in the sky or the celebrity kind. Being a star guide at an observatory sounds kind of cool. YAY! for Julie, and all the others who've had recent releases. Carving pumpkins is hard! I did one a few years ago that took me all day. Had to use a lot of fine tools. I admire whoever did those of the Pixar characters. I do plan to carve a pumpkin this year, but I haven't yet. I've also never been in an observatory, at least a night, but always wanted to. I was captivated by the brightness of the stars in the Cascade Mountains while on a family trip. They were absolutely amazing. However, I was told they are ever brighter in the desert. 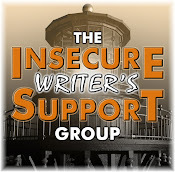 Awesome guest post. It's fun to learn about bloggers 'other' lives. Some interesting book covers your sporting there and great pumpkins. I have never observed starts from an observatory but I have always wanted to. I think it would be amazing. I would also love to look closely at the moon from an observatory. And I haven't carved my pumpkin yet - I need to get to it!! Wonderful, very interesting poster Cassa Universe! Doralynn, you are most welcome. Ella, care to make one for him? I love looking at the stars. One of these days will have to visit MPax as she's just across the border and down one state from me in British Columbia. I'm very fond of MPax's universe. That is a great poster and shows your achievement, Alex. It should rate right up there with your guitars. Thanks for letting me rent some space today, Alex. The view over hear is fantastic. Cool poster your publisher sent you. Nice. So many great books coming out. It's great to see everyone so busy. If you need help using it, Huntress, come out this way. Binoculars can give you sights you've never seen before, Elizabeth. I'm fortunate to have a lot of astronomy boyfriends who know waaay more than I do, Brinda. That's how I learned. It is a fun job, Laura. I love teaching people and giving people their life's dream. I love what I do, Lynda. I guess it shows. My fellow astronomizers say so. Me, too, Suzanne. That's another reason why I love it. Feeling small calms me for some reason. I love doing it, Sandra. The first time I ever looked through a telescope, Bish, was at the observatory. When you think about what you're looking at it is insanely amazing. They're very hard to find, Chris. Central Oregon has some of the darkest skies remaining in the US. You should come out and visit some time, Madeline. Some view is better than none, David. I lived in NYC after college, Karen, so I know. Then DC before coming out west. That makes the job worthwhile, Kitty. A new camera was put on the big telescope this year, Al, so I have lots of pretty pics to share as the winter drags on. It is a blast, Miranda. That is a sad story Brandon/Brian. I knew someone who ran the star tours down there, Jenn. I bet it'd be stunning. She does remember, Stephen. She was back this summer, but I wasn't there. She told the other volunteers to tell me hello. It is quite an adventure, Karen. I think Mary has her head in the stars. And what a great place that is. Congrats to Julie. I loved seeing her here today with her new book. I let the kids carve the pumpkin. My job was to haul it home. We have a local observatory that I've yet to visit. I need to. It's a mezmerizing, humbling thing to do. MPax has it right. We have a great observatory in Cincinnati. Love the pumpkins. Seeing fake sky is not the same thing, Rhonda. That would be disappointing. Fake sky has way more color than real sky. I feel very fortunate, Heather. I know it's a rare opportunity. It's fun to do, Julie. You'll have to come out sometime, Charles. It is a wonderful way to spend the summer, Jo. I hope you get to, Julie. That's what keeps us going out there, Carol. I hope you get to, Christine. It's awesome. That sounds like an awesome experience, Kat. I taught myself a few years ago to pick out where they landed on the moon so I can tell people. There as lovely in the Cascades, Christine. There's usually more turbulence in the air there though which can make the views swimmy. The Moon is awesome in a telescope, Optimistic. Hope you visit an observatory in the near future. It is mesmerizing. I never seem to tire of it, Robyn. What fun pumpkins and super-cool poster, Alex! Mary does sound as if she gets joy from what she does, which is awesome. Congrats to everybody with a book out and to Julie on her cover. Def. want a copy of Spiders. I was given a telescope as a kid, but it was mostly disappointing. My dad's fairly generic set of binoculars was more powerful. Sounds like a dream job, M.
Mary, I first wanted to say that I can see why you love this job so much. You are in the business of fulfilling wishes and dreams... giving gifts. Very inspiring. Second, I wanted to tell you that I am following your blog, but can't figure out how to comment. Your pictures today were gorgeous. Nature is stunning. Congrats to Doralynn, Nigel and Karen. Wahoo! I love Julie's cover and Mary's brand of awesome has me grinning. Star geeks rock! Mary, It must be so great to be a star guide. Most of my viewing is in the back garden, but seeing those things you can't see (or can't see well) with the naked eye is so fantastically rewarding. Lots a cool stuff and it's only Monday... over the weekend I watched "The Last Stand" and The Expendables II".. both very entertaining and just mind free films. It's good to see these types of films being made, since "Escape Plan" buddy films. Rock On, on your poster! Now just your name in lights... I will make some art soon! M. great post. 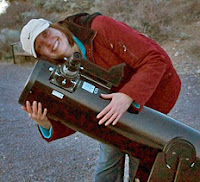 Love your telescope! The bookcovers are awesome, and Alex, the poster rocks! Those are some wonderful moments, Mary. Thanks for sharing! It was great learning more about your job Mary! It's wonderful how you are able to share your joy of star gazing with so many! Love your poster Alex! I still think it's very cool you get to spend time at an observatory, Mary! Whoa! That poster is awesome, Alex! Orion Nebula is my favorite too. It won't be long until the Hunter comes up from the horizon. LOVE your poster. That is so cool. I love the Cassa Universe poster! It looks awesome! Jeremy, thanks! And yes, those are both dumb but fun movies. And I LOVE that Mary could give the guy in the wheelchair a tour of the stars. A great reminder that we don't have to have working legs to be able to look up! I do, Joy. It's a fantastic job to do, even without pay. Binoculars and telescopes have different fields of view, which do give different views, Andrew. For some things, binoculars are best. Thanks, Robin. I love giving the gifts I do. Either click on the title to get to comments, or click on comments on the left sidebar. Jupiter is great. It's up late here and wasn't up this summer, Mark. We did have Saturn, Venus, and Mercury, though. It is, Tony. And I'm fortunate to be surrounded by much more knowledgeable people, so I'm always learning. I love my telescope, too, Joylene. Yes, I volunteer every summer, Johanna. We get lots of visitors from PDX and all around the world. I usually only work Friday nights now. I think so, too, Cherie. It was such a farfetched dream of mine, I never thought it'd come true - to do anything with space beyond look at NASA's photos. Not long at all, Jay. It's up if you want to stay up until it rises. I think around 1ish a.m. now. A dobson telescope can get low enough to accommodate, Elizabeth. It limited what I could point at, but it was rewarding to be able to do that for someone who lives with incredible limitations everyday. Go Nigel, Doralynn and Karen. I like the Eva pumpkin. That's impressive. Mpax, it's cool that with all this tech you enjoy star charts and an electronics-free telescope. It must be great fulfilling dreams. Thanks gor hosting Mary Alex. By the way, I always hated that they are stuck withe name Graboids for the sequels. I preferred Snakeoids. Fun trivia Man. Love Mary. She's so awesome. And yaaaay for Julie's shout out! So stoked for her! Star guide is the coolest job ever. Love that poster and I haven't carved pumpkins since my kids were little. 1. Your job seems awesome, Mary! 2. Congratulations to Doralynn, Karen, Nigel, and Julie! 3. Your poster looks great, Alex! 4. I'm full of exclamation points today! I always wanted one of those big fat telescopes but only ever had a crappy extendable one. I like the old-fashioned way, Maurice. I want to learn. With electronics what do you really learn? It is an awesome job, Susan. They're not too expensive, Mooderino. The smaller ones, anyway. CONGRATS on all the book releases and cover reveals! That is one cool poster, Alex! CONGRATS! I would not think a movie called Ginger Snaps would have a werewolf. It's just...odd. JE, Ginger was the character who turned into a werewolf - thus, she snapped. Is Mini Alex wearing the 4th Doctor's scarf? That poster is very cool! 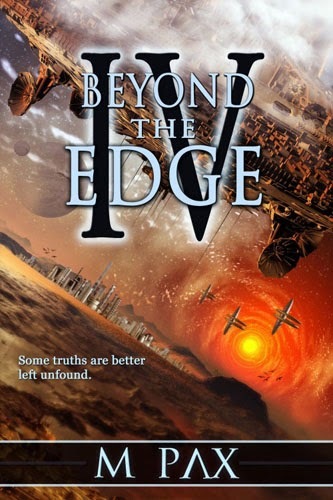 Science Fiction books! That makes me happy. I need to pick up some of Pax's, they all sound good! I love all Mary's posts with observatory pics!! Thanks for allowing her to guestpost Alex! I had to chuckle . . . to bee or not to bee, eh? Long day, I'll catch your post tomorrow. Always good to answer a few questions about yourself. Oh, that kind of star guide,M.Pax. Seriously, I would love to do that. I have been to the Okanagan Observatory in the Okanagan Valley, B.C. However, it was in the daytime. Congrats to all those with new books out. Carving out a pumpkin is not much of a tradition here in England, as you will know. However, it is becomng more popular. Lots of great news this week. Very cool publisher prize Alex. It should go above the fireplace! Aw, Mary. That was such a heartwarming post. I'm all teared up over here. Congrats Doralynn - I want Spiders! (Well, not the real thing, but the book looks cool!) Congrats Karen, Nigel, and Julie! I wish you huge success! M Pax, from your description, I can tell you really love what you do. What a gift, and you get to share it with others! Man... I was wrong about Tremors, lol! 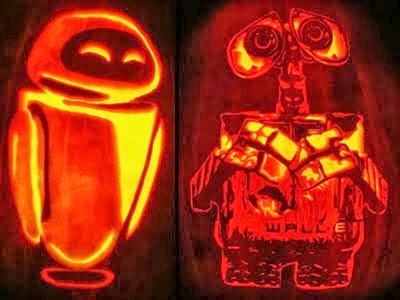 Those pumpkins are amazing :) Walle is such a sweet cartoon. That must have been crazy to carve, but it was amazingly done. I often wonder that vary thing as an adult, Roland. From a galaxy that is 35 million light years away or more, yeah. Glad to make you happy, Danette. A friend of ours, Lee, is from BC, Gary. He was visiting this weekend. He showed me some new things, which I always really enjoy. Aww, Lexa. I love to give something special to others. It feels great when I can. I do love it, Mary, and I'm the least knowledgeable up there. And I think Eric and Tom beat me at star gazing love. GRABOIDS? !I need to watch Tremors again! Love the poster your publisher sent you, Alex! Congrats to Mary and Julie's books they both sound amazing! What a lovely list of astronomy moments. I've been to a planetarium, but what M. Pax does really sounds special and sweet. And Alex, your poster is gorgeous! I LOVE astronomy. LOVE it. She's living an amazing job!!!! Sigh. Seriously, I can stare out of a telescope, roaming it around, for hours. I envy anyone with dark skies, but most of all, those with cloudless skies. Living in the north of England it's hard to find a cloudless sky. I would've stayed up to watch the Orionids recently but it was cloudy, yet again. I did go to Jodrell Bank in Cheshire once. It was awesome, but no opportunity to observe at that time. I love Mary's story about Robert! He sounds like a cool kid. And that poster, Alex, wow! It looks amazing, too cool, way too cool to have that. I hope you've got it in pride of place on the wall. Jack, it looks like the Doctor's scarf, doesn't it? Deniz made it for Mini-Alex. Gary, stop laughing. And difficult to see the stars in the daytime. I didn't know you were a star guide Mary, very cool! I love those Wall-E pumpkins. Very nice, so much cool shading going on. People are talented! Great post MPax! There is nothing better than giving inspiration to kids! The kids and I will be pumpkin carving tomorrow, but I'm sure they won't be that fancy. I did a pumpkin carving contest last year and found it super difficult. I decided to do more of a sculpture instead of a true carving, so I got out my dremmel and had at it. A year later, and I still am finding bits of pumpkin flesh hiding in corners of my garage. And my goblin ended up looking much more like Buddy Holly. Horrible. Sounds like you had a great time being an interstellar tour guide! My wife is an astronomer and when we first met we were living in Tucson. I spent some wonderful nights up on Kitt Peak with her keeping her awake as she worked. The sky was beautiful up there! Very interesting the words of M. Pax! It feels special, Helena, and to freeze at 6300 feet most of the summer and drive 30 miles out into the wilderness, love is required. I can do that too, SC, and often do after the people go home, roam about and fill my eyes with stars. Then I go home and dream about them. The cloud issue exists on the West side of the Cascades, Fanny. We're more fortunate on the arid side, but weather is still often a factor. He was a cool kid, Annalisa. He was also really into whales. He taught me a whole lot about them before he left. I was glad the nebulae weren't it for him. I sort of stumbled into it,JA, and I'm very glad I did. It is wonderful to inspire others, Katherine. The sky is marvelous, Sean. Cool job your wife has. Love the Cassa Universe poster, Alex. Mary, I didn't know that you were a star guide. That's awesome. I love observatories. We have one near us and I really need to go visit sometime! Great list of books featured too, Alex. I just checked out the book trailer for Spiders at Doralynn's blog. It's a good example of a trailer well-done. Short, to the point, and narrated by a perfect voice for the genre. So jealous of MP's astronomical exploits! :D Way to go to all of the authors with books out--particularly, Julie! 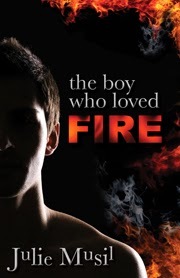 I'm huge fan of her blog, and really excited to The Boy Who Loved Fire. I would love to see stars from a powerful telescope or observatory. I got a telescope for my kids, but my binoculars worked better. The night sky is so amazing! Sean, I used to live there - awesome clear skies! Patricia, wasn't the voice great? It amazes me if I think about it too hard, Rachna. Once upon a time I would have been jealous of me, too, EJ. Different views come from different instruments. Smaller scopes and binoculars have their strengths. Large telescopes have their weaknesses. The universe is amazing, Sherry. Great article from Mary and congrats to all the authors with new releases! Congratulations to everyone on their exciting releases! I love Mary's achievements. Very cool. I've never been to an observatory, but want to go when the kids are bigger. I love listening to Mary talk about the stars. And I got 4 on the monster trivia! Yay me! You'll have to come visit, Shannon. Glad you like to listen, Marcie. Whoa. I loved M. Pax's interview!! What an amazing cool job. That poster is awesome - so glad you got one, Alex! I love Julie's cover but I had to scroll quickly past Doralynn's. My arachnophobia is so bad even that silhouette against the moon gave me the willies. That is an awesome poster! Always good to stop by here... Though I don't comment nearly often enough! That was another great interview over at Almazan's blog and I really enjoyed M. Pax's story about being a star guide. If it didn't take so much time and dedication to learn about astronomy, I could be a star guide, but then I could be a lot of things. Mary, your job sounds absolutely awesome! Congratulations on being able to give back so much! Your book sounds amazing! Wishing you all the best! Alex, great interview! and that poster - wow! #3 is so sweet and so awesome! M. Pax's job sounds so freaking fun! I'm amazed I do it, Liz. So is my family. I'm not really an outdoorsy sort of gal. It'd take us less than one summer of weekends only to teach you, Toinette. It is a blast, Lisa. We have a good time, which is one of the reasons I keep going back. I loved reading about Mary's experiences. My, my, I was gone from the blogosphere for a few days and so much news, all awesome of course. Thanks again, Alex. And thank you to everyone who left a comment. I'm visiting your blogs on my breaks to thank you. It may take a little bit, but I'll make it there! oooh, love your book poster, Alex!!! Happy Oogie Boogie Day. Something weird happened with my last post. It erased all my previous posts and I couldn't get them back until I deleted the post. So weird, because it showed up in Feedly fine. But not in Blogger. Anyway, I liked the spiders and Steeler zombie as well. Fun stuff. Cheers and boogie boogie. Hi Alex .. isn't that Cassa Poster great - no-one you're chuffed and Mini Alex is cheering you on .. I did carve a pumpkin, but it wasn't nearly as cool as those.